Snoring is noisy breathing caused by the vibration of soft tissue in your airway when it is relaxed during sleep. Studies have shown it is common affecting up to 40% of the UK population. It is associated with a condition called obstructive sleep apnoea. This is where the airway narrows to such a degree that it completely closes during sleep so breathing is interrupted. This causes irregular breathing at night which can result in excessive sleepiness during the day. Snoring can have a significant impact on someones life. Sleepiness may affect how you function at work, your concentration levels or raise safety concerns when you drive. Snoring can have wider effects even disturbing a partners sleep and effecting relationships. 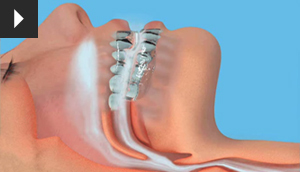 At Lewisham Dental Practice we are proud to offer Sleepwell, an affordable custom made anti snoring device that can help you enjoy a peaceful and refreshing nights sleep. It is worn in the mouth just for sleep and works by holding the lower jaw in its correct position preventing the narrowing of the airways and reducing snoring. Clinical trials have shown over 97% of patients found Sleepwell an effective snoring remedy. 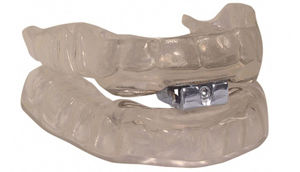 Sleepwell unique features including a soft inner lining, enablement of side to side movement of the lower jaw and most importantly giving the wearer the control to adjust it to maximize effectiveness, all help to ensure a high level of patient comfort. If you would like further information and to see if we can help you with your snoring please contact us for a consultation. We will ask you to complete a pre-screening questionnaire and assess your snoring to see if you are suitable. Please note if there is an indication that you may be at risk of obstructive sleep apnoea we will offer to refer you for further investigation.